CLEMSON, S.C. (AP) — UN Ambassador Nikki Haley says today’s college graduates should be grateful to live in America. 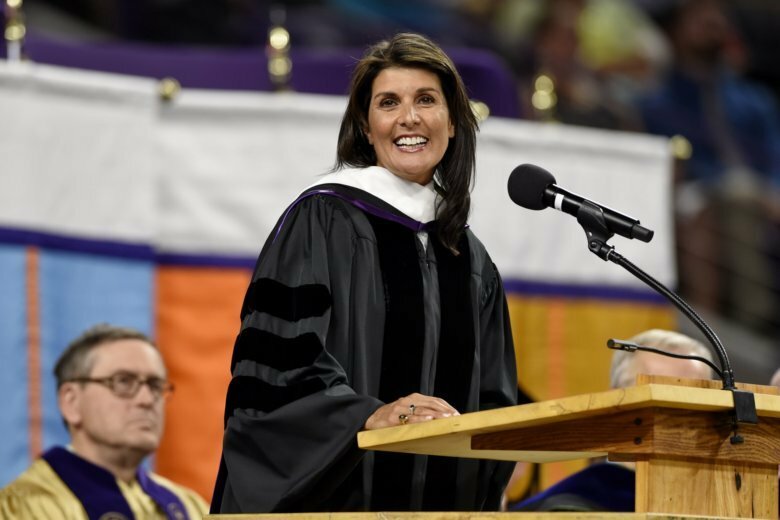 “As a country we are experiencing something of a gratitude crisis today,” Haley said in her commencement address Thursday at Clemson University. First: Beware of social media. She said it makes people obsess with what they don’t have as others post their fake lives. Second: “Be thankful to be alive in America in 2018. Every day at the United Nations, I deal with nations where people are not free,” Haley said. Haley, who graduated as an accounting major in 1994, expressed pride that her daughter, Rena, will be studying nursing at Clemson. And she joked that her parents, who immigrated from India, would be proud to call her “doctor,” now that she’s received an honorary doctorate of humanities degree.